These stunning women's Italian leather opera gloves will make a statement as to any lady's elegant taste. 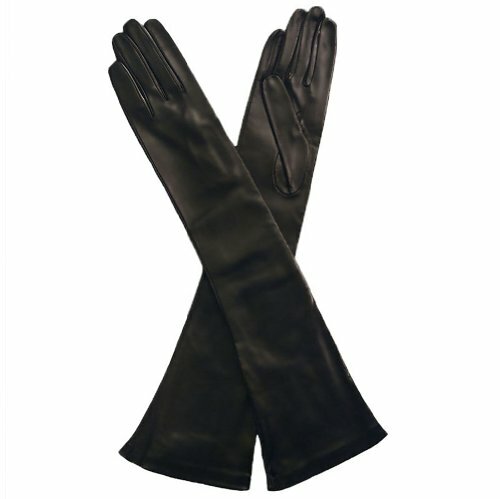 Made of soft kidskin, these 12" from the wrist long leather gloves reach to above the elbow. Total length about 19" to 20". These gloves are made with kid (baby goat) or lamb skin leathers from Italy, cured in Italy, hand-crafted in Italy and lined with 100% Cashmere or Silk. The term, "Italian Leather" does not denote the birthplace of the animal... It denotes the SAFER TANNING PROCESS that is done ONLY in Italy. You should be wary of what you place so close to your skin. Italy imports more than 90% of its raw skins. Hand sewn. Lined with 100% silk. Sizes correspond to the circumference of the palm of the hand in inches. If you have any questions about this product by Solo Classe, contact us by completing and submitting the form below. If you are looking for a specif part number, please include it with your message.